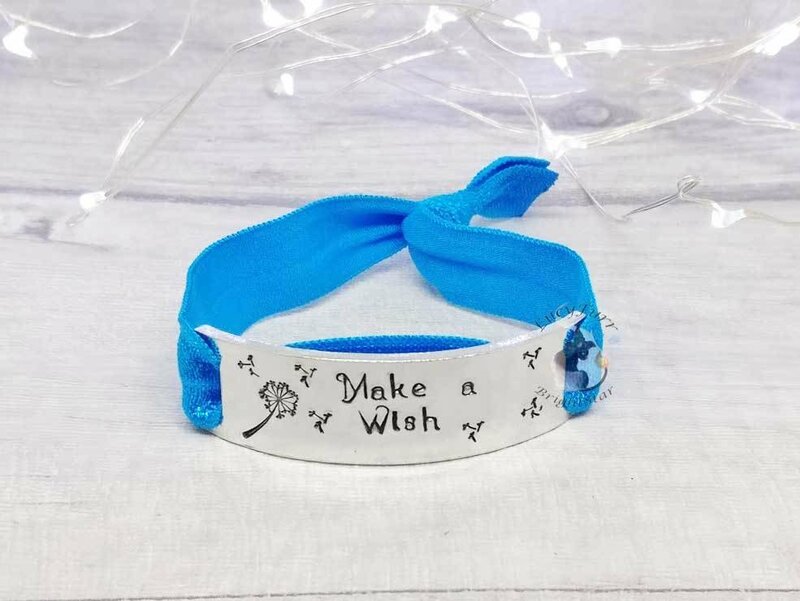 Make a Wish metal stamped bracelet is a beautiful reminder of our childhood games and dreams. It reminds us that we can make things happen if we wish for them hard enough. This bracelets come with an elasticated band that is approx 250mm long all around (9inches) before being knotted, so it will fit comfortably on most wrists. I cut the elastic myself so longer or shorter bands and other colours can be requested than the ones listed can be sourced. The aluminium piece is 15mm wide x 60mm long (approx 0.6 x 2inches). Aluminium is great for jewellery as it is lightweight and hypoallergenic which makes it very comfortable to wear. There will be some marks on the back as the metal pieces are stamped (metal is pushed down to create an impression) and not engraved (surface is scraped to create and impression), but they are minimal and do not affect the overall look of the bracelet at all.